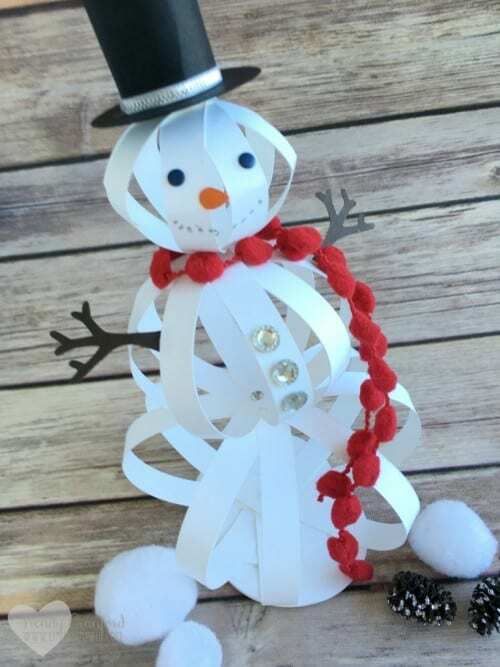 A cute snowman craft to make on cold winter days. Easy DIY paper craft tutorial idea for kids and adults. A fun addition to your seasonal decor! I am so excited to share this cute snowman with you today. This is the perfect craft to make with your little one for Christmas. Super easy to make, and very affordable. Most of the products could be found around the house, or you can order them online. Below you will find the video I created showing you how to put this cute guy together. Make sure you check out my blog by clicking HERE to see other fun crafty projects from my 12 Days of Christmas series. A special thanks to Katie for having me guest post on her blog today. As a special gift, I have created a free downloadable PDF tutorial for this snowman. Just print it out and follow the instructions to create all the snowmen your heart desires. If you liked this post you can find more DIY ideas in my Paper Craft Gallery. This is such a great idea, a perfetc craft to do with the kids. and keep them occupied. Who can resist the cute little hat and the pop pom scarf. Just adorable. This snowman is adorable!!! Thank you for sharing at Welcome Home Wednesdays! Cute craft to do with the kids. Thanks for sharing it on Funtastic Friday! Thank you Heidi! I am so glad you like this project. It would be a lot of fun to make with the kids! Great DIY to do with children. I’ll have to try this one out. Stopping by from the Let’s be Friends party. Thank you Sarah! I am so glad that you like it! It’s sooo cute! Thank you so much for sharing it at The Crafty Corner! I hope to see you again at the next party (beginning tomorrow). Thank you Antonella! I am glad that you like this little snowman. It’s a fun craft!